I'm currently in London, so here's a set of photos I took last week back at my boyfriends in Essex. I've never really had time for playsuits, but I sure am digging them this year. Especially this gorgeous one from Pretty Little Thing, super 70's with it's dark colours & paisley print! I HAD to have it. I loved the long floaty arms and the fitted body feel to it. 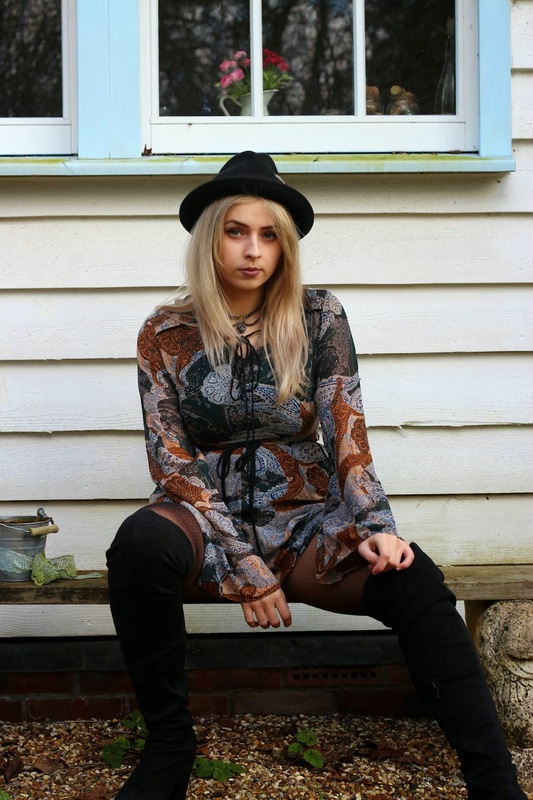 I loved wearing this playsuit with my over knee boots, I feel it really complimented my petite height. A hat, or big hair was the vibe I was feeling for this look, since I had no big hair, I had to use Jack's hat since mine was at home! As I stated in my previous post, PrettyLittleThing really have some awesome stuff in at the moment. Have you seen my PLT spring summer haul? Check it out here. Stay tuned for a MissGuided haul too! I'm loving these photos, especially how the Tibetan flags complement this shoot really well...now I'm debating on investing on knee high boots...just adds something extra to an outfit! All i can say is just wow ! !